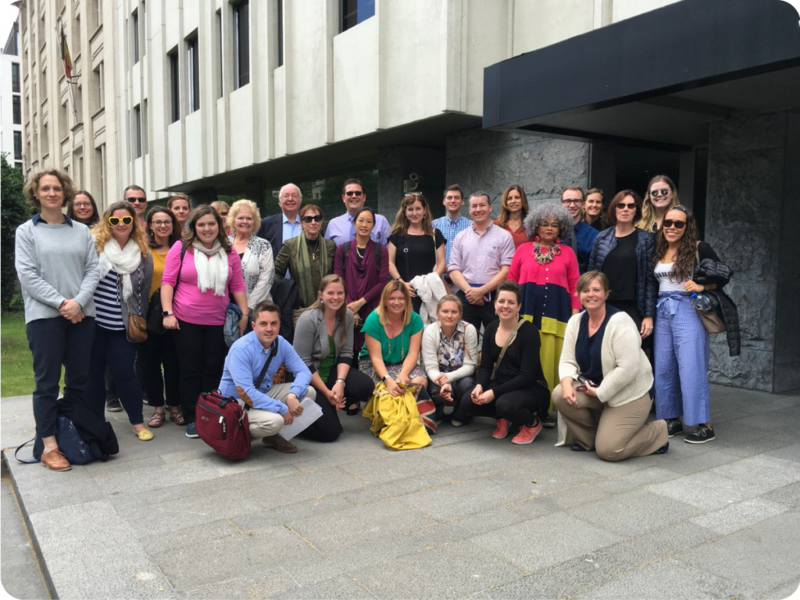 Each year, the UNC Center for European Studies chooses a cohort of NC K-12 teachers, community college instructors, and HBCU/MSI faculty to join a study tour to Brussels, Belgium. This tour, organized by the University of Pittsburgh’s European Study Center (and formerly by UNC-CH) is a five-day professional development opportunity to learn about the European Union in collaboration with university partners from across the nation. For those educators with a strong interest in European Studies, this study tour will provide you with the opportunity to gain first-hand knowledge and experiences to further your understanding of Europe and the European Union. The Brussels Study Tour is by no means a leisure tour. Participants have high-level briefings with EU officials and make important networking connections, while having fun along the way. Most grantees choose to travel before or after the tour as a separate vacation. These study tour grants provide reimbursement for one transatlantic flight up to $1000; group hotel arrangements for the duration of the tour and all programmatic costs are also covered by the grant. Meals, incidentals, and any additional travel costs remain the responsibility of the grantee. The University of Pittsburgh requires a non-refundable administrative fee of $275 per applicant if you are selected by the tour. Participants are asked to create a lesson plan or course module, reflecting new content learned from the tour. The 2019 Brussels Study Tour will take place June 16-22. The 2019 application deadline is March 1. To get an idea of what the tour may possibly be like, please look at a sample itinerary from the 2018 tour. View lesson plans created by past participants. More information specific to each type of awardee can be found below. Any teacher currently teaching in a K-12 public, private, or charter North Carolina school is eligible to apply for a Brussels Study Tour grant. Impact on students – how will the information learned and connections made on this trip reach the students? Teacher impact – how will this opportunity impact the applicant, both professionally and personally? Multiplier effects – how will the resources, information, and connections reach the applicant’s community of teachers at their school or in their district? Many times, because of these three priorities, selected applicants come from either rural districts or Title I schools. However, any strong applicant should be prepared to address these questions. Any Community College instructor currently teaching at a North Carolina community college or faculty member of a NC-system MSI/HBCU. In a Community College or MSI/HBCU applicant, we are looking for many of the same qualities as in K-12 teachers: impact on students, personal and professional impact on the applicant, and multiplier effects. However, a strong CC or MSI/HBCU applicant should also have a documented academic interest in contemporary Europe as shown in their CV. Brussels Study Tour grants and programming are made possible by generous funding from the European Union through the Getting to Know Europe grant.